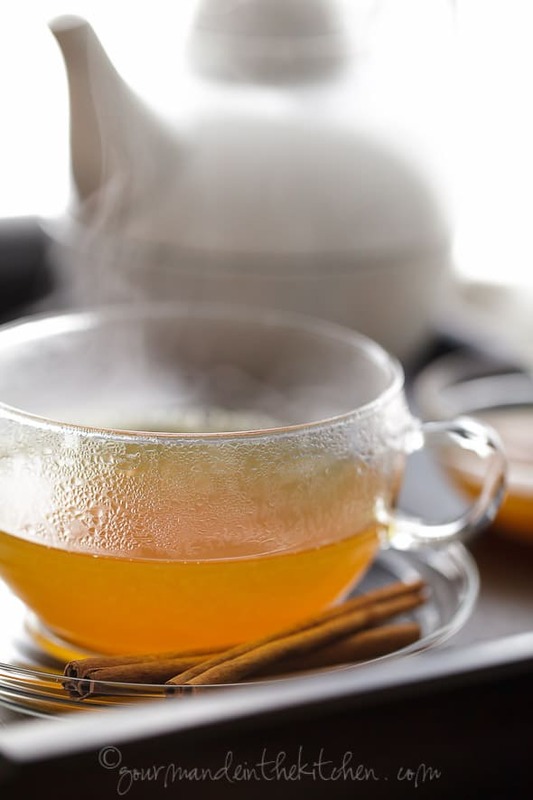 This sweet and spicy cinnamon, ginger and turmeric tea radiates warmth and comfort. A nice cup of tea never fails you when you need it. 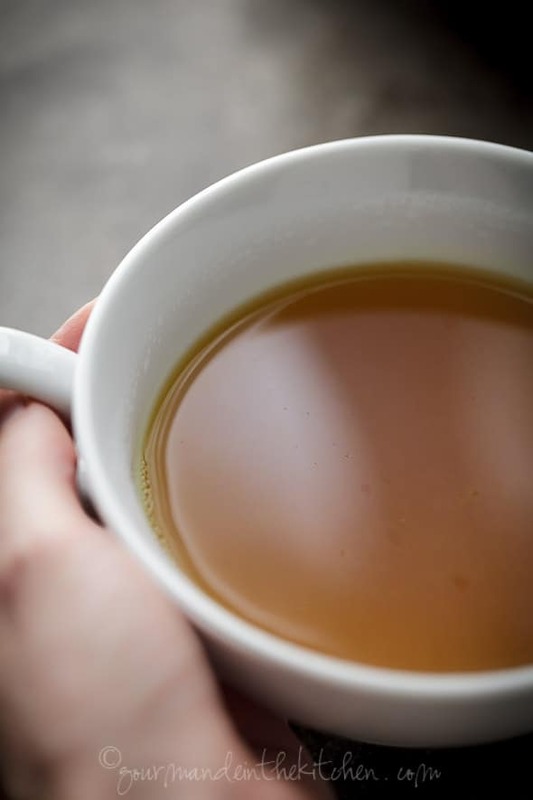 When I’m in need I turn to this recipe, it has become my usual cup as of late; my first choice in the morning, and the one that steams from my mug at the end of the day. The sweet and spicy taste of this bright golden orange tea radiates warmth and comfort and envelopes me with its soothing aroma. 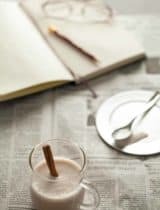 Although technically an infusion and not a proper tea (since it contains no tea leaves and is naturally free of caffeine) its tongue tingling properties are just perfect for the fall and winter seasons when our bodies and immune systems often take a beating. 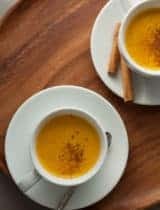 With plenty of hot spices, this naturally warming and anti-inflammatory infusion is just the thing to sooth an ailing stomach or ward off a chill. The key spices here are cinnamon, ginger and turmeric, all with a rich history of medicinal use. An invigorating kick of black pepper and the subtle sweetness of persimmons completes the package; each playing a key role and adding depth and complexity to the final preparation. 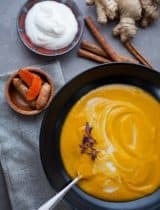 The heat of the ginger and pepper call attention to the earthiness of the turmeric, an accent of cinnamon sets them off and the whole thing is smoothed out by the sweetness of the persimmons. 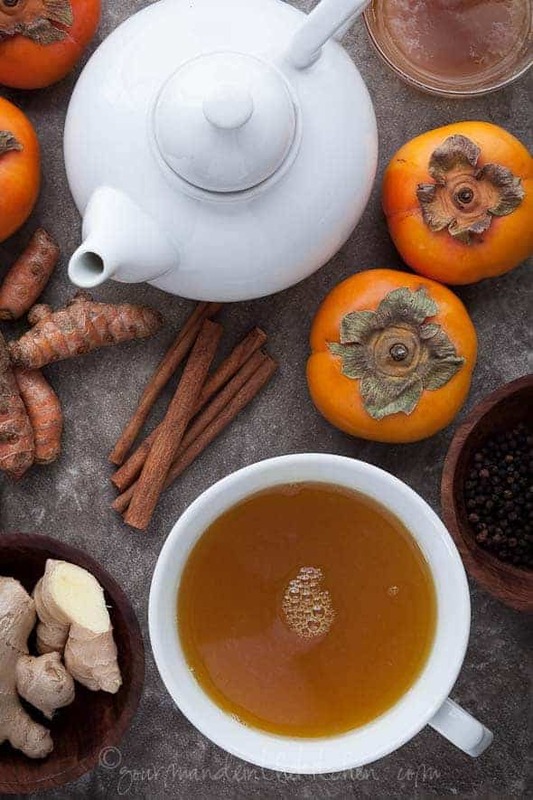 Spicy ginger supports digestion, fragrant cinnamon helps to regulate blood sugar and had anti-microbial properties, sweet persimmons in tea are a natural Asian remedy for acid reflux and earthy turmeric along with the black pepper has anti-inflammatory and anti-cancer properties. The bioavailability of the active part of turmeric called curcumin is greatly enhanced by the presence of piperine which is found in black pepper which is probably why turmeric and black pepper are found together in curry. 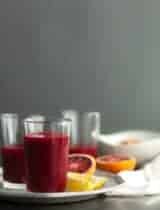 Rest assured that this decidedly fortifying elixir only requires the slightest effort on your part and can be prepared in large amounts to keep on hand in case of need (ahem…post holiday meal perhaps?) And while it’s simmering away on your stove it has the added benefit of wrapping your house in the unmistakably cozy smells of the season. 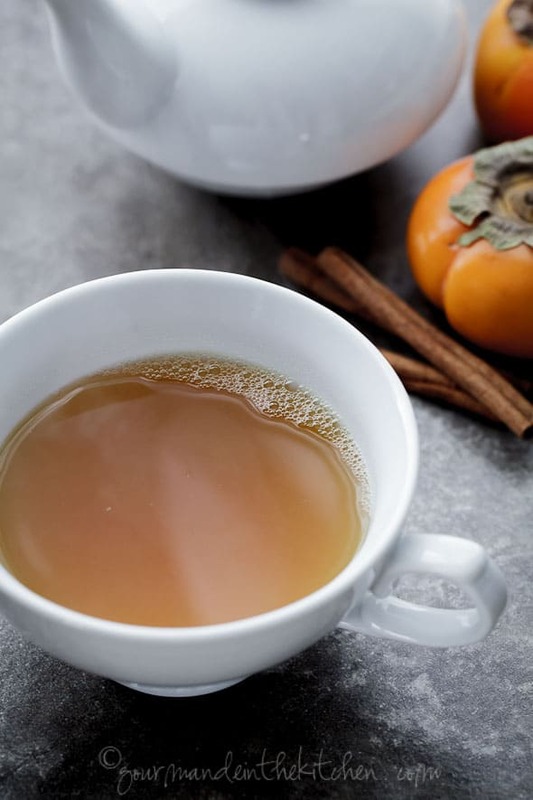 In this tea ginger supports digestion, fragrant cinnamon helps to regulate blood sugar and has anti-microbial properties, persimmons are a natural remedy for acid reflux and turmeric along with the black pepper has anti-inflammatory and anti-cancer properties. Place the water, ginger, turmeric, peppercorns, cinnamon sticks and persimmon slices in a large saucepan and bring to a boil. Lower heat, and simmer on low for 20 to 30 minutes. Strain tea through a fine mesh strainer (or pour through a coffee filter to catch sediment). Pour into cups or bowls. 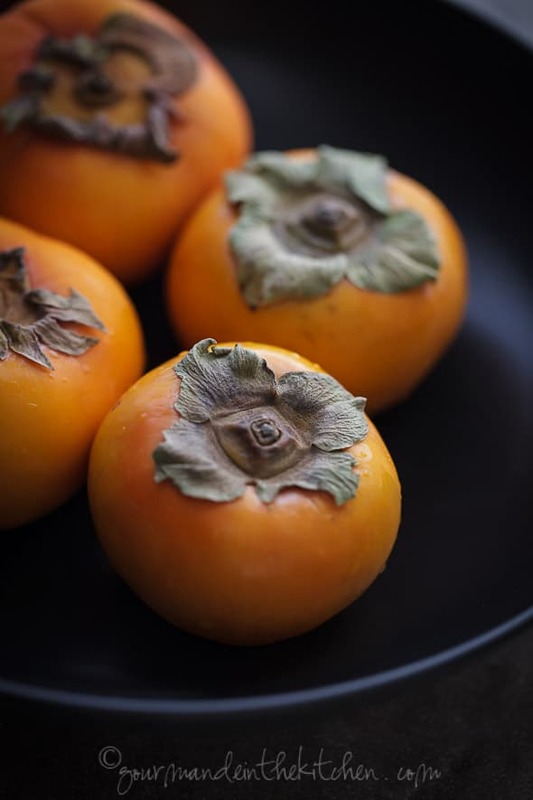 The softened persimmons may also be added or add a few fresh slices for garnish and serve adding preferred sweetener to taste. Alternatively you can cool the tea to room temperature and refrigerate for a couple of days and reheat as desired. Save this recipe right to your online recipe box. You can add ingredients from each recipe to your shopping list and take it to the store with ZipList's free mobile app. To add any recipe to your list or recipe box, click the "save recipe" button at the top right corner of the recipe, then sign up using your email address, Facebook or Twitter account. SUCH beautiful persimmon - wow! I bet the tea is just so full of depth and great unique flavor! these are the most beautiful pictures! My Dad used to add fresh apple slices to his teas, and while I like dried berries in my green cuppa I quite enjoy tge sound of your flavour combination Sylvie, too! Turmeric is so good for us. Apart from the orange fingers if I'm not careful, it's fantastic stuff. I love your tea. I could use a nice cup of this tea together...brrr - love the idea of persimmon in tea with all these warm spices. Sylvie, how much water? I feel like I must be overlooking that part somewhere, but don't see it :) Thanks - love tumeric in tea! No you aren't overlooking anything, it's my mistake sorry! I accidentally omitted that but I've updated the recipe now to reflect the amount of water needed which is 8 cups. I enjoy fruit teas and I don't think I've had any with persimmon before. Lovely idea and so full of goodness! How much water, and when do you put the persimmon in? With the spices? This sounds so delicious! Eight cups of water and yes the persimmons are added in with the spices. I've updated the recipe to reflect those omissions, sorry about that! Marvelous! And such lovely Shots! A delicious and warming kind of tea. 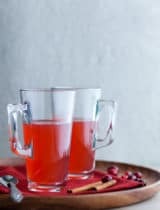 I totally love herb and fruit teas - this is enticing! 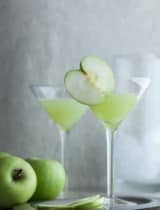 this looks like the perfect drink to ward off the evening chills. Your pictures look gorgeous as always! I really love the combination of flavors in this, it sounds so different and lovely. What a fantastic and wonderfully healthy recipe I'll make even in our summer months, as long as I can find persimmons! Use turmeric and ginger almost every day anyways . . . Thanks :) ! Oh... I love the idea of fruit teas :) This gorgeous cup is perfect. What an exotic cup of tea... and absolutely amazing! Tea is the ultimate comfort! I love these flavors; just wish I had a mug right now! Sylvie, I'm not a big hot tea drinker and I want this! it's looks beautiful and so full of flavor! Sounds so deliciously soothing! Never tasted persimmon in tea, can't wait to try! That really looks so wonderful and comforting, Sylvie. I keep seeing persimmons at my grocery store, and now I have a reason to buy them! This set of photos are my most favorite of yours. Simple, sophisticated and understated. I love it! This is just a list of my favourite things in a recipe! I have never tried an infusion like this. I can barely imagine the beautiful aromas. I wonder if we can find persimmons down here...I believe I have seen them. So much to try...so little time to try it all Sylvie! Wow! What a lovely tea. I had my first persimmons last year and loved them. This looks so yummy and warming. 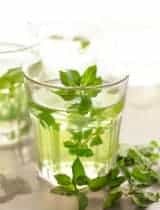 Looks like a very fragrant + relaxing tea! What a wonderful array of flavors for tea... delightful! now this is a tea I could drink all day everyday! YUM! Wow Sylvie what a warming and delicious tea. I have really been enjoying persimmon this year and those spices pair perfectly with it. Thanks for sharing! Oh this is so funny, I just recently started making turmeric tea because it is so so good for you. Your recipe looks much better than the way I was doing it so thank you! How interesting! 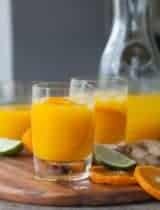 I would like to know how the taste like -I must find fresh turmeric roots first of course. Very nice photos always. Brilliant + beautiful! Love to try this. I love persimmon, what a beautiful way to use it! Such a gorgeous recipe and perfect for this time of year. Finding fresh turmeric in Oregon is rediculous, can powdered turmeric work as well? Yes, you can certainly substitute powdered turmeric if that's what you have on hand.